President Donald Trump announced on Saturday that in exchange for border wall funding, he would extend temporary protections for so-called "Dreamers" and those with Temporary Protected Status. President Donald Trump announced on Saturday that in exchange for border wall funding, he would extend temporary protections for so-called "Dreamers" and those with Temporary Protected Status -- two key issues for congressional Democrats who nevertheless appeared to hold their ground on refusing the president's demand for $5.7 billion in wall funding. "Our plan includes the following," Trump announced in a speech from the Oval Office. "$800 million in urgent humanitarian aid, $805 million for drug detection technology to help secure our ports of entry, an additional 2,750 border agents and law enforcement professionals [and] 75 new immigration judge teams to reduce the court backlog..."
Additionally, Trump promised "critical measures to protect migrant children from exploitation and abuse," and "a new system to allow Central American migrants to apply for asylum in their countries." In return, Trump said he wants his $5.7 billion in border funding, which he said would be "a strategic deployment of physical barriers, or a wall." Later in the speech he took a more confrontational approach with his plan. "Our plan includes the following: $800 million in urgent humanitarian aid, $805 million for drug detection technology to help secure our ports of entry, an addition 2,750 border agents and law enforcement professionals [and] 75 new immigration judge teams to reduce the court backlog," the President said. Trump noted that he promised a wall on the southern border during his campaign and “I intend to keep that promise one way or another. Trump also said that Senate Majority Leader Mitch McConnell would bring the proposal to a vote in the Senate this week. Yet, before Trump even made his 4 p.m. speech, House Democrats were calling it a "non-starter." Twenty-five minutes before the planned start of the president's speech, House Speaker Nancy Pelosi released a statement, saying that "initial reports" about Trump's announcement "make clear that his proposal is a compilation of several previously rejected initiatives, each of which is unacceptable and in total, do not represent a good faith effort to restore certainty to people’s lives." "It is unlikely that any one of these provisions alone would pass the House, and taken together, they are a non-starter," Pelosi continued in the statement. "For one thing, this proposal does not include the permanent solution for the Dreamers and TPS recipients that our country needs and supports," Pelosi said, referring to Temporary Protected Status designations. Bi-partisan legislation known as the BRIDGE Act (Bar Removal of Individuals who Dream and Grow our Economy) would extend protections and provide work authorization for three years for TPS individuals and "Dreamers" -- some 750,000 young, undocumented immigrants who arrived in the U.S. as children and have met the requirements to participate in the Deferred Action for Childhood Arrivals (DACA) program. The continuing shutdown -- which could head into its second month this week -- affects about a quarter of the federal government. Trump has said he will keep the government shut down until and unless the Democrat-controlled House of Representatives heed his demand for $5.7 billion to build more than 200 miles of walls between the U.S. and Mexico borders. Democrats recently offered about $1.3 million for border barrier funding. Trump’s announcement followed a visit Saturday morning to Dover Air Force Base in Maryland, where the president met with the families of the four Americans killed in Manbij, Syria . At the base, Trump participated in the dignified transfer of Scott Wirtz, a 42-year-old civilian contractor who was killed in the deadly ISIS bomb blast on Wednesday. The so-called transfer of the remains of a fallen military member unfolds with strict solemnity, as a casket draped in an American flag is carried off an aircraft to a waiting vehicle which takes the remains to a mortuary. In a somber moment, the president walked on board a C-17 aircraft that held the transfer case. Inside, a chaplain led a prayer over the deceased. The president, who was joined by Secretary of State Mike Pompeo and acting Secretary of Defense Patrick Shanahan, stepped off the plane and stood silently in formation with his right hand in a salute as the case was carried to a transfer vehicle by the Navy Ceremonial Team. The four Americans – an interpreter, a Navy chief cryptologic technician, a Department of Defense civilian and an Army chief warrant officer – were killed in a suicide bombing last week, the deadliest attack on US military since troops went into Syria. ISIS claimed responsibility for the attack. 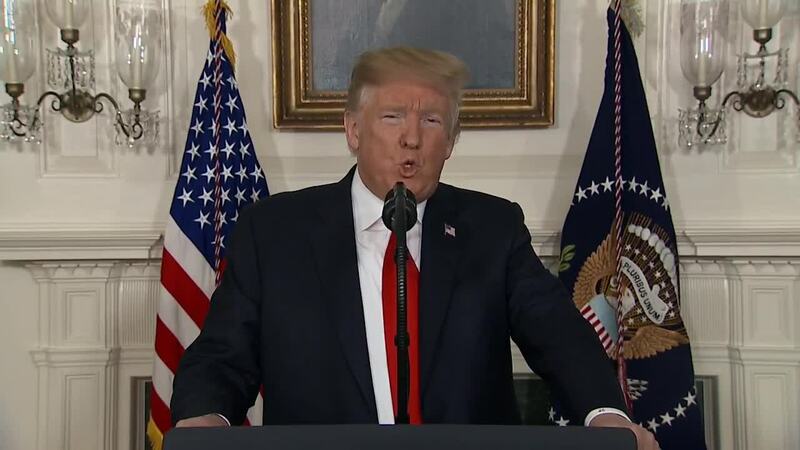 The deadly bomb blast came one month after President Trump declared plans to withdraw U.S. troops from Syria, having – he said -- completed the mission to defeat ISIS. This is not the president's first time to pay his respects to the fallen at Dover. Last February, the president made an unannounced trip with Ivanka Trump for the dignified transfer of a Navy SEAL killed in Yemen. Before departing for Dover the president told reporters on the White House South Lawn that meeting with the family members of fallen soldiers is one of the "toughest things I have to do as president." In a video posted to Twitter Friday evening, Trump called the situation at the southern border both a "humanitarian crisis" and a "national security crisis." He added that it would be necessary to secure the border and that "if we don't do that, we're a very, very sad and foolish lot." The president's promised announcement came amid an increasingly nasty back-and-forth with Democratic leaders over the protracted government shutdown -- which this week could head into its second month -- and funding over his long-desired border wall. After House Speaker Nancy Pelosi asked the president to postpone his State of the Union speech due to security shortages brought on by the shutdown, Trump blocked her use of a military aircraft for an official overseas trip with a congressional delegation, and suggested that she could make the trip to the war theater in Afghanistan. On Friday, Pelosi accused the president and his administration of leaking her plans to possibly fly commercially instead and endangering lives as a result.